After feeling faint on Sunday, Lisa Verschueren was taken to the hospital where the doctors discovered a heart condition. Lisa will undergo surgery in the next few days as she will have to have a defibrillator. It is always sad when a gymnast retires, but it is even sader when it wasn't the gymnast's choice. Lisa Verschueren (Sportiva Sint-Gilli-Waas) was a great asset for Team belgium, always consistent, always there when the team needed her and she definitely was a contender for the 2016 Olympic team. Lisa has been part of the National Team for the past four years as a Senior. She made her senior debut in 2011, and she was already very promising at only 16 years old. She competed at four World Championships (2011, 2013, 2014 and 2015) and three European Championships (2011, 2012 and 2014). Belgian Champion in 2014, she got stronger and steadier with years, gaining experience for what would have been the ultimate goal: the Olympic Games. This year, Lisa competed at the very first European Games, where she qualified for the floor exercise final and finished in 4th place. 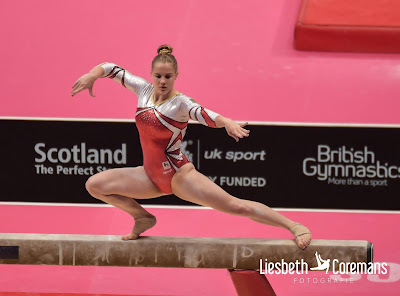 In Glasgow, at Worlds, she helped the team qualify for the Rio Test Event but she also was the best Belgian. She qualified for the all-around final and got the best result ever achieved by a Belgian gymnast at this level: a 17th place finish. I always loved Lisa on floor, which I think, is her best event. She always put so much epressiveness in her routines and the last one she got truly matches her. She will be missed among the fans and among her teammates with whom she had so many beautiful memories. But now, it is time for her to take care of herself. I have no doubt the future has great plans for her and no matter what, Lisa will be remembered as one of the gymnasts who left her mark in Belgian gymnastics history. Lisa, thank you for everything you've done for the sport. We love you!